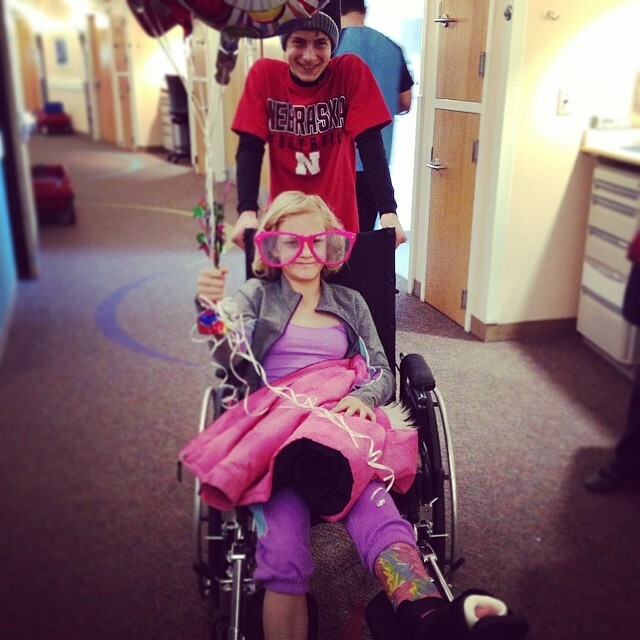 Claire had a tendon lengthening surgery on Friday. The goal of the surgery is to release some of the tightness in her left leg (an effect of cerebral palsy) so she can have better balance and mobility. We’re very excited about that prospect. We’re not as excited about four weeks in a hip-to-toe cast. So far Claire is, per her feisty usual, recovering well. She’s already putting weight on the leg and tooling around with a walker and in a wheelchair. It’s just the logistics of a cast that big that is tough. Going to the bathroom, for example, is an unbelievably complicated task fraught with many dangers. We’re also still working to manage pain and comfort levels. She’s got a pretty high pain tolerance but she’s also used to sleeping on her tummy, something that seems nearly impossible in this monstrosity. So we use pillows and stuffed animals and try to make it work. The first two nights I felt like I had a newborn again (something I’m obviously too old to try because it made me ridiculously emotional). I went to bed dreading how soon I’d be awakened by Ada to tell me Claire had to go to the bathroom. Just like the good old days. But then yesterday Dan let me have an uninterrupted nap and last night Claire slept all night without pain meds or getting up to pee. So this morning I think we’re going to make it. We still have to figure out the logistics of school. Luckily, Grandma Cheri is one of her teachers and can help with the technical work of the restroom. And Claire has been practicing her wheelchair moves. One big plus of all of this is the extra weight-bearing and exercise her left hand is getting with the walker and the wheelchair. That’s one thing she probably wouldn’t have done on her own and it should really help the weakness in her left arm because it’s forced to be a strong link instead of a weak one. So that’s where we are, friends: hanging in there! Thankful for an opportunity to see Claire get stronger even if in the meantime we’re forced to stay a little closer to home and depend on each other a little more than normal. All good things. I pray it goes so much better than it feels right now. And faster. And more forgettably. And with even better success on the other side than you’re expecting. Amen. Praying strength for all. As she is forced to strengthen her physical body parts others are forced to strengthen their patience, kindness, encouragement and stamina. Oh and their reliance on others. Hoping for great results. Wow, after all these years, I still remember that feeling of going to sleep dreading how soon I’ll have to wake up again. So proud of all you troupers. Our hearts are with you guys. One of our biggest challenges when Ev was in a chest to toe cast was making him comfortable.He sleeps on his side. It gets better! And this sounds weird but the 4 weeks will fly by. Praying for Claire and you all. To use a popular phrase, “you got this.” There is so much you have already figured out how to get through. 28 days. That is less than Lent. Less than a non-Februrary month. Less than summer vacation from school, and think how short that feels! !